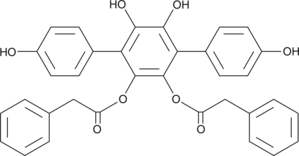 Vialinin A is a terphenyl compound originally isolated from the fungi T. terrestris and T. vialis. Terphenyls, in general, are recognized as strong antioxidants. Vialinin A potently inhibits the release of TNF-α (IC50 = 0.09 nM) and IL-4 (IC50 = 2.8 nM), as well as β-hexosaminidase and CCL2 (MCP-1) from IgE-stimulated RBL-2H3 mast cells. Vialinin A does not significantly increase lactate dehydrogenase release from RBL-2H3 mast cells, suggesting low cytotoxicity. Cross selling for this product : Vialinin A There are 4 products.